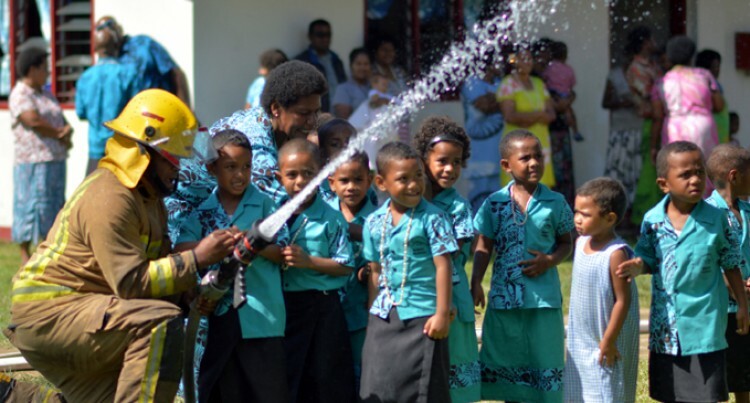 Students of Kasala Kindergarten in Komave Village along the Coral Coast will no longer have to walk through the rain to the school toilet facilities. School manager Una Letewale said the kindergarten acknowledged neighbouring five star resort Warwick Fiji providing the funds to build the facility for the tots. The facility was opened by the general manager of the Warwick Fiji, Brad Downton, and Korolevu Health Centre medical officer Dr Elisabeth Dass. School Manager Una Letewale said prior to this they had to walk some distance to the facility which was attached to the community hall. “It’s been a long term goal of the school to have its own facility for its young students. “We are privileged to have the Warwick Fiji assist us and we thank them for the continued support,” she said. Mr Downton said, over the years, the Warwick Fiji had been contributing significant funds to communities in the area for projects that benefit the villages. “The resort was committed to assisting the community in projects and what better way to help celebrate pre-school week than to officially open these facilities for the children of the kindergarten,” he said. He said these initiatives for the people of the neighbouring communities of the The Warwick Fiji, Naviti Resort and Tambua Sands highlighted the commitment for the wider communities for many years to come. One of the highlights for the tots during the opening was the opportunity to use fire hoses, uniform and gear for the firefighters as part of the demonstration by the nearby Korolevu Fire station officers. The firefighters were on hand with two fire trucks to present fire safety and awareness programmes to members of the village who attended the opening of the new block.